I bet you all out there know this band by now. But there should actually be no one out there knowing about this band since they profess suicide. What I am trying to say is that once you listen to the band you feel this urge to commit suicide, don't you ? Don't take me wrong though, I never meant you should do so if you buy one of their album. Everybody is free to do whatever he wants with his live. As for me, they could explain all ways to commit suicide, I would not follow their instinct. I have never been disappointed with any of their releases since they came out with Down and their vocalist Ville Laihiala. And this album is certainly not going to disappoint me. 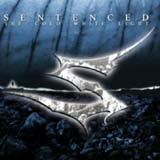 Sentenced stays indeed true to their three latest releases, Down, Frozen and Crimson, but tries to manage to bring something fresh to their music. On the other hand I would also say that they stay too true to their aforementioned previous albums. As for myself, I certainly don't care too much since this is what I like in Sentenced. Would you like to see such a band getting back to their death metal roots ? I would not… definitely not. The production is again really good, as modern as an album by such a band must sound. This time they recorded the album at Finnvox Studios. For Crimson they had gone to Tico Tico Studios after recording Down and Frozen at Woodhouse Studios. The songs are again filled with melodies, and they are melancholic as hell, but whereas such songs as Bleed in my Arms, No More Beating as One, Killing you Killing me or even Dead Moon Rising from Crimson had a real potential to become classics among classics, there seems to be no songs with this potential on this new album. Don't take me wrong again, the songs are good, but none of them really outdo the others. They are just traditional Sentenced songs. OK, so to sum up with this review, all those out there who bought their previous albums can blindly buy this one again, for it is as good as its predecessors. So will I… of course (I am not fully satisfied with promos).